Because you need more than just the right skills to be a successful entrepreneur. No matter what anyone tells you, entrepreneurship and starting your own business is not for everyone. Now, if you’ve perused any past articles of mine, you would know I continually say that we all have a fair shot at pursuing our passion. In other words, I believe you learn the necessary skills for being an entrepreneur as you go along. So then you might be scratching your head, wondering what I’m talking about when I say entrepreneurship is not for everyone. Let me explain. When many people talk about becoming an entrepreneur and starting your own business, they talk about what business skills you need. Their advice usually sounds like: you need grit, the power of persuasion, and a whole lot of hustle if you’re going to survive as an entrepreneur! But the problem with this advice is that they people divorce business from the rest of life. When they talk about starting a business, they completely ignore the factors that have to line up in your life outside of work. A meaningful life does not divorce work and life. It seeks to integrate the two. So if you’re going to build a business that matters—one that’s meaningful to you and your family—then you need to make sure your life is conducive to being an entrepreneur. In other words, just don’t look at your business skills when looking to become an entrepreneur; look at your entire life. If your life isn’t conducive to having your own business, then don’t start a business. We love the all-American story of the hero who rises against all odds to become the very best. But these stories usually ignore the community that actually exists around the person in order for them to become the hero. No one becomes a hero without a little help and support. Why? Because when the going gets tough, you need people surrounding you who won’t let you quit. And when you fail (because you will and you should), you need the cushion of other people’s love and support to break your fall and help get you back on your feet. You can’t survive as an entrepreneur without it. On a similar note, you need the approval and acceptance of your loved one if you’re going to start a business. Too many people treat business like it’s a solitary thing, when it doesn’t matter what others says, as long as you’re pursuing your dream. But you do need the support of key people in your life. Without it, you won’t get far with your dream. It’s easier to build when you have a strong foundation. When you have a weak foundation, everything crumbles faster. So don’t pursue business if your spouse doesn’t approve. Be transparent with everything, and work as a team. This might not seem like it’s an essential, but trust me—you need to keep a record of your thoughts. 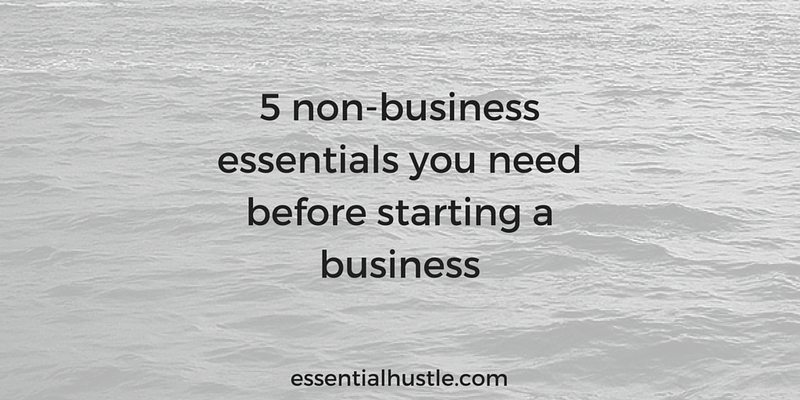 When you get started with entrepreneurship, everything in the beginning will be a mad dash to get money through the door. In this hustle, it becomes so easy to lose sight of your soul and how you’re developing as a human being. I find that by keeping a journal and writing down my thoughts, I’m able to retain my humanity. I’m able to keep track of how I’m progressing as a spiritual and emotional person. If you have no clue what to write in your journal, start with your core values and a list of what you’re most thankful for every day. Soon you’ll find your focus moving off of business as usual, and back onto the things that make life meaningful. There are many entrepreneurs who suggest “taking the leap”—which means, quitting your job without anything lined up. This only works if you have savings, or something to buffer your time without a steady income. But hear me out, savings is not just a monetary thing. When people think having savings, they think of having at least 3 months worth of rent in their bank account. This is a kind of savings. But I think you can survive if you have savings of another kind. You can have relational savings—where loved ones and friends can help you out if need be. And you can also have skillset savings—where you pick up old but profitable skills to make money now. The point is, you need a savings of some kind. It’s never a wise idea to start a business without having going for you. And finally, you need a clear motivation to drive your new endeavor. Why? Because business is hard! And after a number of failures, it can be so easy to forget why you started a business in the first place. Without a clear WHY, you can keep sacrificing your soul to “the hustle” and end up with a business that’s not meaningful to you. A strong and deep WHY can rescue you from work that isn’t meaningful. Not only that, but having a clear picture on your WHY and your values helps you brand your business better and attract your quality audience. For instance, if you want to build a business because you want people to live a quiet and meaningful life, then you might not want an audience of people who are only concerned with making millions of dollars. That’s not important to you, so it would make your business harder to speak to these people. All this to say, you need to know what you believe and why you believe it. Your business will prosper because of it. If you’re looking to build a business, look at more than just your skills or how much money you have saved up. Look at the factors of your life, like your values and your spouse. In the end, doing work that matters is not just about being successful at business—it’s about being successful at life as well. Here’s to not divorcing the two. I totally agree on the savings part. It’s not about taking the leap; it’s about building a bridge. Excited to follow your journey, Neal. You’ve come a long way!